Do you get bogged down selling the technical features and functions of your product or service? Are you unable to discover the story your prospect has in their head about why they need a solution? Have you ever annoyed a prospect because you asked too many questions? Sales decisions are invariably driven by emotion and sellers who fail to engage, persuade and inspire are missing opportunities and it's costing us dearly. Do you remember Mike Bosworth's Solution Selling? Bosworth tells a cracking story in What Great Salespeople Do of when he and a colleague learned that his questioning technique no longer worked, but stories do. And what about the Challenger Sale or Insight Selling? These techniques promote storytelling yet don't quite tell you how to do it. We've been teaching business storytelling for over 15 years now and have helped some of the world's largest corporations put stories to work including Microsoft, Mars, Electronic Arts, Teradata, SAP, and Danone. We can help you develop practical story skills. And we help sellers do this with our Storytelling for Sales program that will teach you the techniques you need to effectively tell the story of your products and services, discover your prospect stories and close more deals faster. Stories that share insight and convey emotion inspire a prospect to take the next step. Prospects want to know how others did it, and how your offering made a difference. Bullet points just don't cut it. Instead, a well-told story helps prospects picture a future where they're benefitting from your solution. And Storytelling for Sales integrates with your sales approach to enhance what is already in place. Sellers are busy people. It's hard for you to put aside a day to learn a new skill. That's why we encourage you to bring a live opportunity and improve it with stories to help make progress in closing your sale. You will have your own stories, but often they are hidden away in the recesses of our memories. During the day we will help you remember your stories to build up your story bank. Full one-day workshop. The workshop is highly interactive as we firmly believe in the power of practical activities to foster learning. Throughout the day you will engage in hands-on activities designed to build your storytelling skills and confidence. Our unique Deliberate Practice Program to embed the learning. The program runs over six months. Each week, you receive a short email suggesting an activity to practice your new-found storytelling skills. We have some other tips and tricks too to share to make your learning stick. 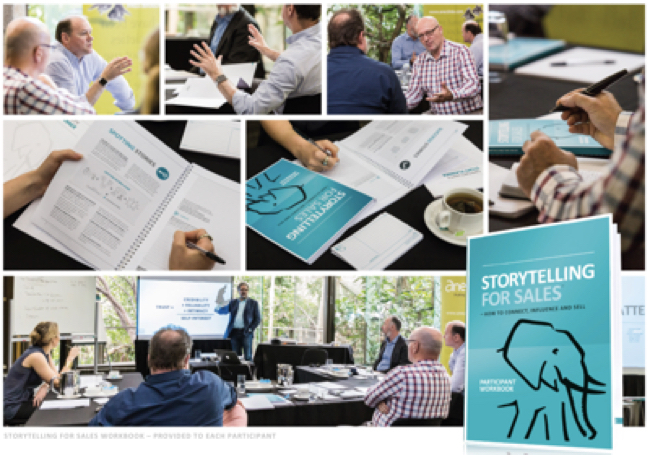 We have designed Storytelling for Sales for any seller or sales manager who wants to influence, inspire and make more sales, faster.